Every day, more plastics are added to the world’s waters. From coastal regions alone, between 5.3 million and 14 million tons of plastic find their way to the oceans each year. By 2050, the amount of plastic in the ocean is expected to ‘outweigh the fish’, says Jim Leape, co-director of the Stanford Center for Ocean Solutions. Currently estimated to be 150 million tons, they take a very long time to biodegrade – an estimated 450 years to never. Almost 700 species that we are aware of have been affected by plastic pollution, ranging from tiny creatures to the largest, and some are already endangered. 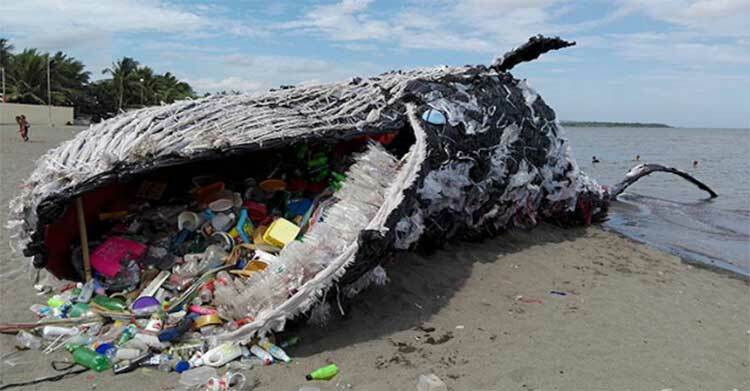 Whales have already fallen victim to plastic contamination. This past June, a whale in Thailand died from ingesting more than 80 plastic bags. And a sperm whale was found dead on a beach in Spain with 29 kilos of plastic in its stomach. Australian researchers studying a large sample of sea turtles recently reported in Nature that half of the baby sea turtles had stomachs filled with plastic. They calculated that turtles have a 50% probability of death after ingesting 14 pieces of plastic, and that younger turtles are more likely to be harmed. Can plastics affect human health too? The answer is ‘yes,’ and in various ways, depending on the kind of plastic. Diethylhexyl, found in some plastics, is a carcinogen. Bisphenol-A (BPA), present in some plastic bottles and food packaging materials, can interfere with human hormonal functioning and can be ingested through water or from eating contaminated fish. Some toxins in plastics are known to cause birth defects, cancers, and immune system problems. Cadmium, mercury, bromine and lead are highly toxic, although now restricted or banned in plastic manufacture in many countries, some for several decades. Yet a recent 2018 study examining the water of Lake Geneva, Switzerland, found levels of these chemicals sometimes beyond the accepted limits under EU law. The findings were a testament to how long plastic pollution remains in the environment, the metals being released as the plastics break down over time. It is very difficult to study the exact impact of plastic pollution on humans because plastic pollution is so widespread that ‘there are almost no unexposed subjects’, notes a researcher. Norway has managed to recycle a remarkable 97% of its plastic bottles. It achieved this by installing plastic bottle machines that return money in exchange. The UK is considering adopting a similar strategy. Denmark recycles far more plastic bags than the United States: an average Dane uses four single-use bags per year, an American almost one per day. How do they do it? Denmark adopted a tax on plastic bags in 1993 and the bag is not free – it costs about 50 cents, part of the money going to the tax and part to the store. The effect has been a reduction in the sale of bags by over 40% over the last 25 years. One can only hope that more countries will follow. The United States currently recycles only about 9% of plastics. According to an EPA study this past August, the U.S. recycling rate actually decreased in 2015. Could the Scandinavian techniques help? Only a handful of states in the U.S. have passed laws regarding deposit machines; adding laws requiring a charge for plastic bags or a tax, as the City of Chicago did, is not impossible. For years China has been importing much of the world’s scraps, including 40% of U.S. recyclables. But in 2018, China placed a ban on imports of plastics, mixed paper, and other materials. Recycled plastics from the U.S. to China dropped 92% in the first five months of the year. California may be especially hard hit, as it had been exporting about a third of its recyclables, amounting to 15 million tons in 2016. 62% of those exports went to China. It is unclear whether the U.S. will be able to cope with the increased influx of recyclables on home territory. Sadly, even if the U.S. and all developed countries had sufficient machines and facilities to reach Norway’s 97% level of plastic bottle recycling, it would not be enough to save the oceans. This is because the bulk of ocean plastic pollution comes from developing countries who often lack recycling and waste pickup infrastructure. In 2010, one researcher estimated that half of the world’s plastic pollution was generated by just five Asian countries: China, Indonesia, the Philippines, Vietnam, and Sri Lanka. The statistics also showed a percentage of mismanaged plastic waste. Eight countries had over 80% mismanaged plastic waste: Indonesia, the Philippines, Vietnam, Sri Lanka, India, Pakistan, Burma, and North Korea. These are developing nations and they often do not have a proper waste and recycling infrastructure. In the Philippines, recycling is sometimes done slowly and laboriously by hand picking from dump yards. Not surprisingly, much is washed away to sea. The Pasig River that flows through Manila carries an estimated 72,000 tons of plastic downstream each year, and the river has been declared “biologically dead” since 1990. Of course, developed nations could provide aid to help create a recycling infrastructure where it is lacking. But such foreign aid without educating the public of its necessity is unlikely. Then there is the intriguing possibility of actually scavenging ocean plastic. Boyan Slat’s giant flexible tube, appended on its underside with a curtain barrier, will be shaped into a U to trap the plastic, which a sister ship will retrieve for recycling and safe disposal. Due to ocean currents, the plastic collects in the relatively stagnant ocean pools between them easing the job of Mr. Slat’s device. The Ocean Cleanup, Slat’s foundation, displays five such sites in the world’s oceans: one each in the North and South Atlantic and Pacific, and one in the south Indian Ocean. They claim the device can clean up 90% of the floating waste. Everyone is rooting for him. Ordering fewer products online could help, as packaging is a huge source of pollution and often includes bubble wrap, made of low-density polyethylene. It is not the easiest form of plastic to recycle and it comprises 20% of global plastic waste. Bringing ones own bags to a local store would be far less taxing on the environment. Minimizing foam cups and takeout containers would be highly beneficial – they are made from polystyrene, which is difficult to recycle. Avoiding the use of straws, when possible, would aid sea creatures. Straws, made of polypropylene usually end up in the ocean. Polypropylene comprises 19% of global plastic waste. Reusing and recycling as much as possible is a mantra that cannot be repeated too often. Collectively, we could make a difference. And if we can also pool our resources to help developing countries recycle, then perhaps we can save our oceans, the turtles, the whales, and even, us. Meena Miriam Yust is an attorney based in Chicago, IL with a special interest in the environment. This article first appeared in CounterPunch.org.